1.- Fill the two jars about half full of water. Check the water level is the same in both. 2.- Make a foil cover for one of the jars. 3.- Leave both jars in a warm place for a few days. 4.- Check the water levels again. 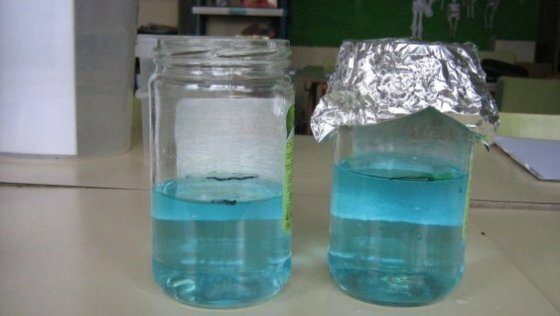 Which jar has less water in it? The heat makes the water evaporate in both jars. 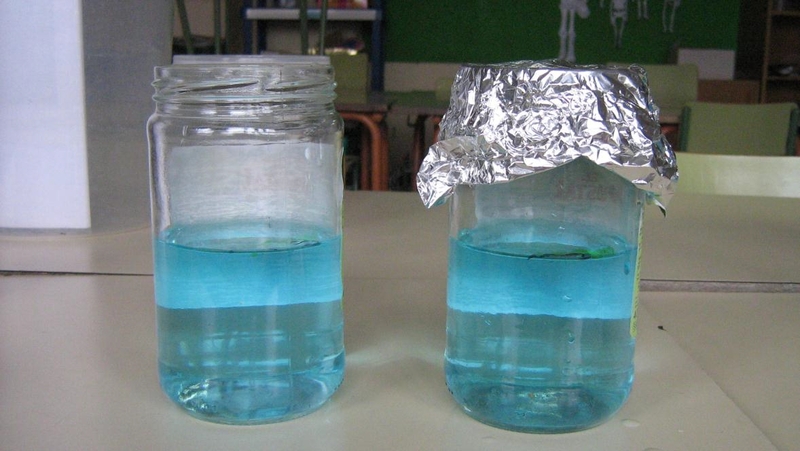 But the foil cover stops the water vapour escaping into the air, so the level of water remains higher in this jar. 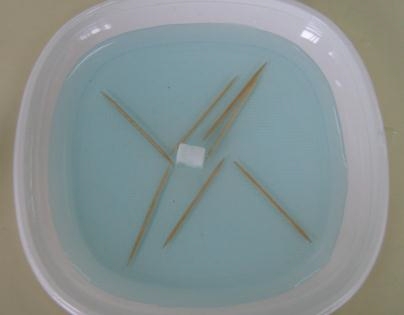 1.- Carefully lay the matches on the surface of the water. When you put the sugar lump in the middle of the plate, it absorbs some of the water. 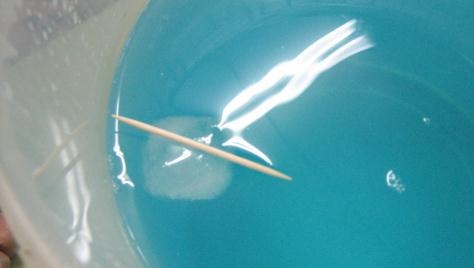 A small current of water flows towards the sugar and pulls the toothpicks with it. 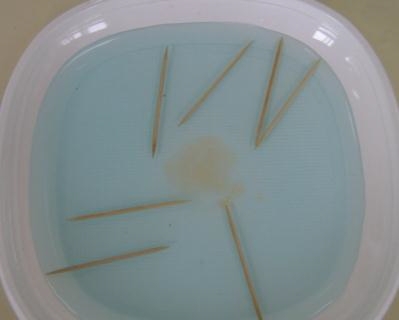 But when you hold the soap in the middle of the plate the stronger surface tension around the edge of the bowl pulls the toothpicks outwards. 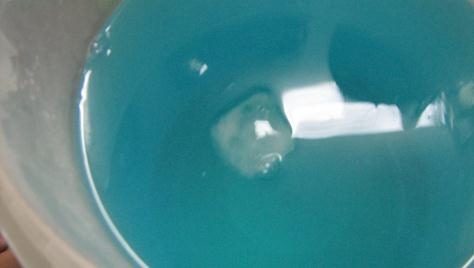 1.- Float the ice cube in the bowl of water. 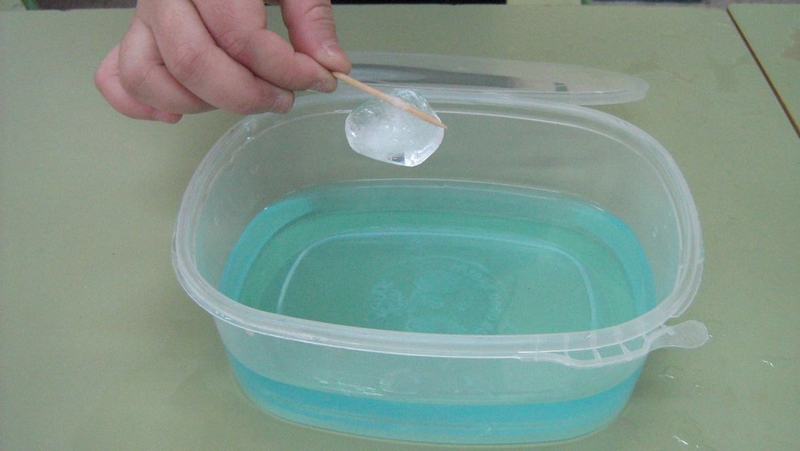 2.- Lay the toothpick carefully on the top of the ice cube. 3.- Sprinkle a little salt around the toothpick. 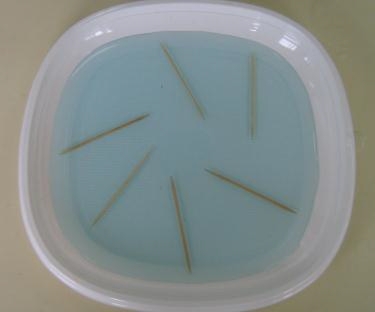 4.- Wait a few seconds and try to use the matchstick to lift the ice cube. 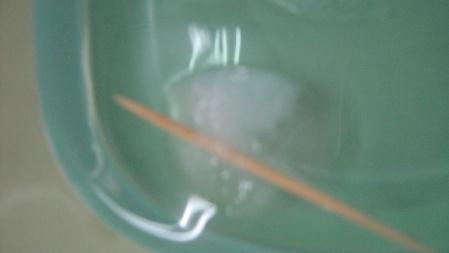 When you sprinkle salt onto the ice cube, it makes the ice around the matchstick melt. This is because salty water freezes at a lower temperature than fresh water. But no salt falls under the toothpick and it becomes frozen again into ice. This allows you to lift the ice cube with the toothpick. 1.- Tie the string around the neck of the bottle. 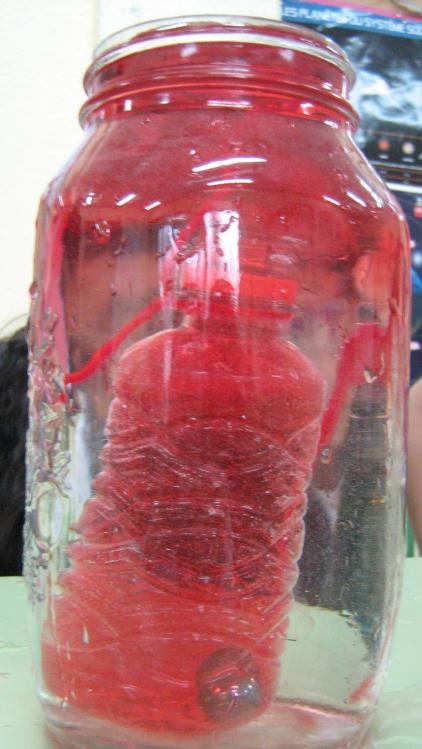 2.- Fill the bottle with hot water and add some drops of food colouring or ink. 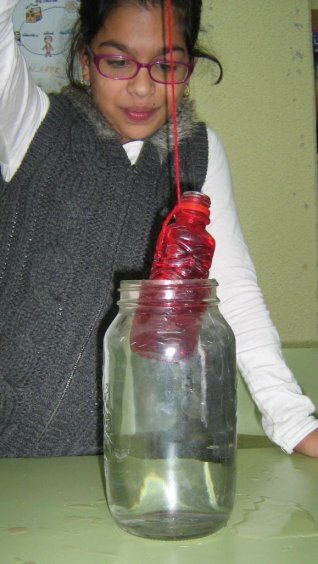 3.- Carefully lower the small bottle into the large glass jar. Watch as the coloured water rises upwards, like a volcano. The hot water is lighter than the cold water so it rises and floats to the top of the jar. Later, as the hot water cools, it will mix evenly with the cold water and all the water will become the same colour.